Creating a place of fun in your backyard for your children is easy if you decide to use one of our children’s yard equipment plans. Whether you’re looking for a multi-level jungle gym, a swing set, or other children’s play structures, we have a variety of do-it-yourself plans that will have your kids thrilled with delight when completed and ready for them to enjoy. 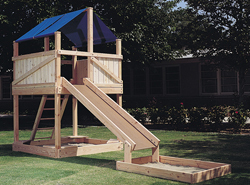 Our collection of children's yard equipment plans includes many fun types of do-it-yourself projects perfect for kids. We offer detailed blueprints that allow you to easily build a fun family project all on your own. With a wide variety of plans, we are sure that you will find the perfect do-it-yourself project to fit your needs.